Wide Input Voltage Supply Range: 4.5V-18V. 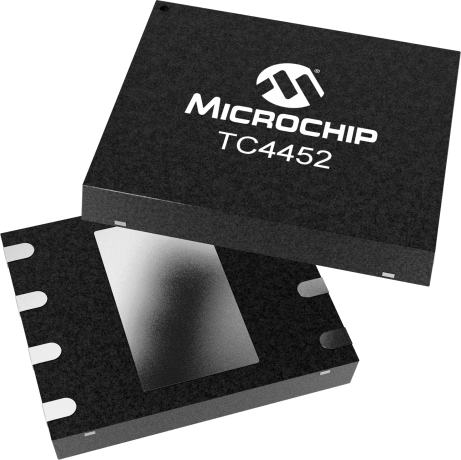 The TC4451/52 are single-output MOSFET Drivers, which are high-current buffer/drivers capable of driving large MOSFETs and Insulated Gate Bipolar Transisitors (IGBT). Their high drive current of over 12A is capable of driving some of largest power transistors in use today. The TC4451/2 have matched leading and falling-edge propogation delay times and have very low cross-conduction current to minimize the overall power dissipation of the device. They will not latch up under any conditions within their power and voltage ratings. They are not subject to damage when up to 5V of noise spiking (of either polarity) occurs on the ground pin. They can accept, without damage or logic upset, more than 1500 mA of reverse current (of either polarity) being forced back into their outputs. Additionally, all terminals are fully protected against up to 4kV of electrostatic discharge.